• Vattanac Capital stands 187.3M tall. 31 Zoned Lifts; With 31 zoned lifts by Schindler’s latest destination control system, PORT, tenants will have fast and secure access to their offices. Even at full building occupancy, at morning rush hour or at lunch, the waiting time should be less than 35 seconds. International Quality and Safety Standards; Designed by TFP Farrell’s and constructed by POSCO E&C in accordance with British/Hong Kong building codes, the development sets a new benchmark for building quality and safety standards in Cambodia. LEED; The development has received a pre-certification for the Silver Award in Leadership in Energy and Environmental Design (LEED) from the US Green Building Council. This demonstrates the development’s green credentials and it’s commitment to sustainable development. Raised floor and column-free interior; With column-free interior and up to 300mm of gap between the structural slab and the raised floor, tenants will be able to plan their interior with maximum flexibility and efficiency. Vattanac Capital has continued progressing well throughout Q2/2013 and now the first phase imminently project nears completion. With tenant fit-outs beginning and available from June 2013, tenants will begin occupying space within Vattanac Capital and operating their new Grade A offices from August 2013. 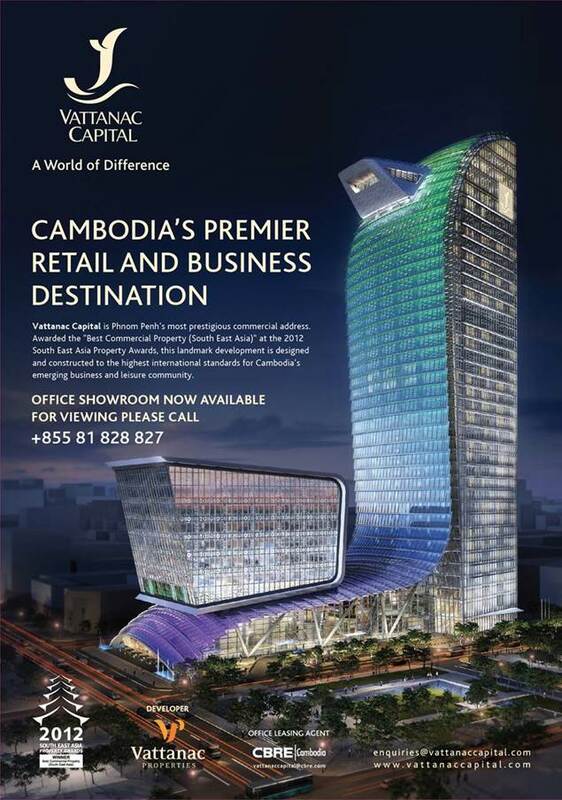 Vattanac Capital will be Cambodia’s first truly Grade A Property (by international standards) and will increase the supply of office accommodation in Phnom Penh to in excess of 200,000 sq.m. CAMBODIA’S INDUSTRIAL SECTOR CONTINUES TO THRIVE AS FOREIGN INVESTORS LOOK TO CAPITALISE ON MARKETS. Cambodia remains an attractive destination for industrial work with a low inflation rate of 3% and a low minimum wages of $80 per month. The CBRE Asia Pacific Logistics Rental Index recorded a slight increase of 0.7% q-o-q in Q1 2013 compared to just under 1.0% q-o-q in Q4 2012 as rental growth remained weak for a third consecutive quarter. Annual growth also continued to decline, falling to 4.4% y-o-y. Leasing activity slowed during the quarter as occupiers opted to stay in their existing premises. Cambodia’s main imports remain that of finished goods with the main products being that of petroleum products, cigarettes, gold, construction materials, machinery, motor vehicles and pharmaceutical products. Imports reached $8.84 billion in 2012. In the first quarter of 2013, Cambodia’s textile exports reached $1.34 billion compared to $1.14 billion in the same period last year, with export commodities primarily including clothing, timber, rubber, rice, fish, tobacco and footwear. In 2012, exports totaled $6.14 billion. Factory rents in most markets – particularly China – continued to record steady gains in Q1 2013 along with the improvement in regional exports. In southeast Asia factory rents are generally stable. In Cambodia rents also remain stable as a continuation of trends seen in 2012, with prime locations in industrial zones commanding rents of $2.5sq.m. Rents in lower quality industrial zones, where units are of a lesser standard, offer rents of $2sq.m. There remains a distinct lack of supply of industrial units as occupancy levels in existing industrial parks continue to rise. The development of new industrial units has been slow as a direct result of the economic downturn, and the associated impact this had on the construction sector. Increasing labour costs in China and Japan continue to drive the demand for industrial property within Cambodia. In particular, Japanese manufactures are seeking opportunities to relocate operations to Cambodia. Demand for factory space mainly came from tenants in heavy industry. Manufacturers in the chemical and automotive sectors were particularly active in setting up plants in new markets, followed by companies in the consumer electronics and industrial machinery equipment sectors. The opportunities to relocate to Cambodia in search of better production prospects are supported by the improving infrastructure, in particular the deep sea port of Sihanoukville. The supply of industrial units will be a key influential factor in the growth of Cambodia’s economy, ensuring that foreign direct investment (FDI) can continue to drive the markets. A number of industrial zones have been proposed for development within sites acquired for the purpose of satellite cities. These industrial zones will provide industrial units to the North, South, and North West sides of Phnom Penh, and will cover approximately 7,000 hectares of land in total. They will be supported by revolutionized infrastructure enabling further development of import and export opportunities. These developments are still likely to focus more on land disposals than matching market demand and supplying rental units. This can largely be put down to the low returns achieved from current rental prices. Economic growth in Asia Pacific is expected to gather pace over the course of 2013 and reach around 4.8% y-o-y for the year as whole. The Cambodian economy has continued its high growth rate as real GDP growth has expanded to 7.5% in 2013. Cambodia is one of the worlds fastest growing countries, and thus opportunities for foreign investors to capitalize on low production and labour costs will drive the industrial markets forward. The demand for industrial rental units in prime locations remains high in 2013, as Chinese and Japanese companies look to relocate due to high production costs in their retrospective countries. Although the increased demand is unlikely to be met by future industrial parks. The market is largely dominated by owner occupied locally owned garment factories currently. CBRE predict this will change as different manufacturers enter the market. The serviced apartment market has continued to grow during Q1 of 2013, with demand increasing concurrent with Cambodia and especially Phnom Penh’s strong commercial and economic growth. The serviced apartment market is still heavily driven by the number of foreign nationals residing in Phnom Penh, an ever increasing and diverse range of people. The market has further matured and developed with the addition of new high quality serviced apartment complexes which have entered the market and achieved high occupancy rates within a short timeframe. Phnom Penh currently has in excess of 15 fully serviced Grade A apartment buildings offering a wide range of high quality accommodation, facilities and amenities. One and two bedroom apartments continue to dominate the lion’s share of the total supply over that of larger suites, with one and two bedrooms providing 76% of the total supply. In real terms the total supply of serviced apartments (Grade A and Grade B), is now in excess of 85,000 sq. m.
The completion of the Bellevue and Street 334 developments coupled with the introduction of Chateau D’Meliya later this year, will provide a wider choice and variety of accommodation; offering further studio and three bed units. There are a total of 18 apartment developments currently under construction within key residential areas of Phnom Penh that will continue to provide additional supply for a market where demand outstrips supply. Across the market Grade A Serviced Apartments continue to have the highest occupancy rates, achieving averages of 99%. Grade B accommodation is up Y-o-Y, achieving average occupancy rates of 90%. These figures represent the success of well planned new serviced apartment complexes, in prime locations, with good well designed accommodation. Demand for serviced apartments in Phnom Penh remains high as evidenced by increased occupancy levels in Grade A and Grade B accommodation. Foreign nationals continue to boost the demand for serviced apartments in Phnom Penh, and with levels continuing to increase, demand will remain strong and absorb the new supply allowing rents to remain stable. Demand for 3 bedroom accommodation is noteworthy with supply being scarce. A total of 30 three bed units have been introduced so far in 2013, of which, 25% occupancy has already been achieved. considering the higher rents and longer rents terms on these units this demonstrate healthy demand. Current market rents range from US$8/sq.m up to US$42/sq.m. The average rental price across the market is $19.50/sq.m. As provisions for serviced apartments become more readily available, rents are likely to fluctuate. Grade A serviced apartment rents are expected to increase in respect of relevant demand, with Grade B rents decreasing to maintain high occupancy levels.